Sacred Geometry - the architecture of GOD. The universe is created by a consciousness which manifests in physical reality through a blueprint that we call Sacred Geometry which repeats over and over giving the illusion of linear time. This was created by THOTH. Thoth was the wisest of the Egyptian gods. 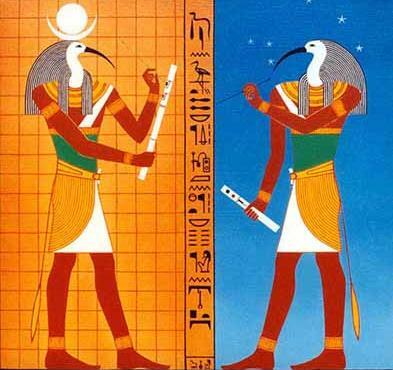 Thoth was usually depicted with the head of an Ibis. He was the Scribe who wrote the story of our Reality then placed it into grids for us to experience and learn. He was also called the God of the Moon. According to Thoth, the Great Pyramid and all of the sacred sites in Egypt were built following the geometries of the human body. The name Thoth means 'Truth' and 'Time'. Thoth was the Master architect who created the blueprint of our reality based on the mathematics of sacred geometry. Anywhere in this cosmos, the Circle, Triangle, Square, Hexagon, etc. remain the same unchanging archetypes. 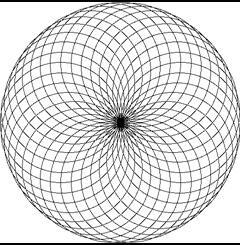 Worlds turn in this, and the galaxies spin because of it, sacred geometry. This is pure universal truth springing directly from God Mind. The perfect and timeless realities of geometry are THE fundamental concepts of the universe; THE first archetypes. This is literaly, The Architecture Of The Universe, sacred geometry. The contemplation of God's Sacred Geometry has been eternally observed as a legitimate path of enlightenment, both scientific and spiritual. Studying the natural unfolding of the geometric archetypes aligns our human consciousness to the infinite and the eternal. In these studies and meditations we begin to see the way of things....the true nature of the universe. In nature, we find patterns, Sacred Geometry, designs and structures from the most minuscule particles, to expressions of life discernible by human eyes, to the greater cosmos. These inevitably follow geometrical archetypes, which reveal to us the nature of each form and its vibrational resonances. They are also symbolic of the underlying metaphysical principle of the inseparable relationship of the part to the whole. It is this principle of oneness underlying all geometry that permeates the architecture of all form in its myriad diversity. This principle of interconnectedness, inseparability and union provides us with a continuous reminder of our relationship to the whole, a blueprint for the mind to the sacred foundation of all things created, thus Sacred Geometry. Starting with what may be the simplest and most perfect of forms, the sphere is an ultimate expression of unity, completeness, and integrity. There is no point of view given greater or lesser importance, and all points on the surface are equally accessible and regarded by the center from which all originate. Atoms, cells, seeds, planets, and globular star systems all echo the spherical paradigm of total inclusion, acceptance, simultaneous potential and fruition, the macrocosm and microcosm, sacred geometry. The circle is a two-dimensional shadow of the sphere which is regarded throughout cultural history as an icon of the ineffable oneness; the indivisible fulfillment of the Universe. 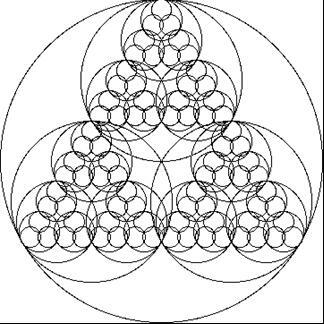 All other symbols and geometries reflect various aspects of the profound and consummate perfection of the circle, sphere and other higher dimensional forms of these we might imagine, sacred geometry. The ratio of the circumference of a circle to its diameter, Pi, is the original transcendental and irrational number. (Pi equals about 3.14159265358979323846264338327950288419716939937511...) It cannot be expressed in terms of the ratio of two whole numbers, or in the language of sacred symbolism, the essence of the circle exists in a dimension that transcends the linear rationality that it contains. Our holistic perspectives, feelings and intuitions encompass the finite elements of the ideas that are within them, yet have a greater wisdom than can be expressed by those ideas alone, sacred geometry. At the center of a circle or a sphere is always an infinitesimal point. The point needs no dimension, yet embraces all dimension. Transcendence of the illusions of time & space result in the point of here and now, our most primal light of consciousness. The proverbial "light at the end of the tunnel" is being validated by the ever-increasing literature on so-called "near-death experiences". If our essence is truly spiritual omnipresence, then perhaps the "point" of our being "here" is to recognize the oneness we share, validating all "individuals" as equally precious and sacred aspects of that one, sacred geometry. Life itself as we know it is inextricably interwoven with geometric forms, from the angles of atomic bonds in the molecules of the amino acids, to the helical spirals of DNA, to the spherical prototype of the cell, to the first few cells of an organism which assume vesical, tetrahedral, and star (double) tetrahedral forms prior to the diversification of tissues for different physiological functions. Our human bodies on this planet all developed with a common geometric progression from one to two to four to eight primal cells and beyond, sacred geometry. Almost everywhere we look, the mineral intelligence embodied within crystalline structures follows a geometry unfaltering in its exactitude. The lattice patterns of crystals all express the principles of mathematical perfection and repetition of a fundamental essence, each with a characteristic spectrum of resonances defined by the angles, lengths and relational orientations of its atomic components, sacred geometry. The square root of 2 embodies a profound principle of the whole being more than the sum of its parts. (The square root of two equals about 1.414213562...) The orthogonal dimensions (axes at right angles) form the conjugal union of the horizontal and vertical which give birth to the greater offspring of the hypotenuse. The new generation possesses the capacity for synthesis, growth, integration and reconciliation of polarities by spanning both perspectives equally. The root of two originating from the square leads to a greater unity, a higher expression of its essential truth, faithful to its lineage, Sacred Geometry. The fact that the root is irrational expresses the concept that our higher dimensional faculties can't always necessarily be expressed in lower order dimensional terms - e.g. "And the light shineth in darkness; and the darkness comprehended it not." (from the Gospel of St. John, Chapter 1, verse 5). By the same token, we have the capacity to surpass the genetically programmed limitations of our ancestors, if we can shift into a new frame of reference (i.e. neutral with respect to prior axes, yet formed from that matrix-seed conjugation. Our dictionary refers to the word matrix both as a womb and an array (or grid lattice). Our language has some wonderful built-in metaphors if we look for them! The golden ratio (a.k.a. phi ratio a.k.a. sacred cut a.k.a. golden mean a.k.a. divine proportion) is another fundamental measure that seems to crop up almost everywhere, including crops. (The golden ratio is about 1.618033988749894848204586834365638117720309180...) The golden ratio is the unique ratio such that the ratio of the whole to the larger portion is the same as the ratio of the larger portion to the smaller portion. As such, it symbolically links each new generation to its ancestors, preserving the continuity of relationship as the means for retracing its lineage, sacred geometry. phi = phi^2 - 1; therefore 1 + phi = phi^2; phi + phi^2 = phi^3; phi^2 + phi^3= phi^4; ad infinitum. 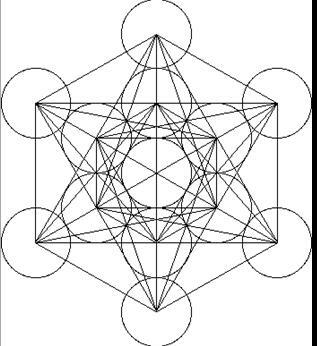 ratio of segments in 5-pointed star (pentagram) considered sacred to Plato & Pythagoras in their mystery schools. Note that each larger (or smaller) section is related by the phi ratio, so that a power series of the golden ratio raised to successively higher (or lower) powers is automatically generated: phi, phi^2, phi^3, phi^4, phi^5, etc. who moves through many realities as teacher. come here through the Gates of the 12 Pyramid Matrix. genetic memories to be found at the end of a cycle. as the teachers and healers of their timelines. a cycle which transcends time and space. And I shall help and guide them. temple which will take you to twelve pyramids of light. a physical reality in which souls can experience. stood on the Earth plane placed there by design. unique in frequency and purpose. entities for a total of 36 creational forces. life forms of different shapes and designs. the tones of crystals to create. which linked together all things on and off the planet. This was in the form of a matrix, web. wrote this book for you to find at this time. Within the book are your keys. A great pyramid was built by my design on the surface of the planet. It would be a duplicate of that which is above and would link to it. to guide and teach the souls who would come to this place. a time once entered in the story of humanity. reality yet holds its creation in place. The mathematician credited with the discovery of this series is Leonardo Pisano Fibonacci and there is a publication devoted to disseminating information about its unique mathematical properties, The Fibonacci Quarterly, a Sacred Geometry. Fibonacci ratios appear in the ratio of the number of spiral arms in daisies, in the chronology of rabbit populations, in the sequence of leaf patterns as they twist around a branch, and a myriad of places in nature where self-generating patterns are in effect. The sequence is the rational progression towards the irrational number embodied in the quintessential golden ratio, sacred geometry. This most aesthetically pleasing proportion, phi, has been utilized by numerous artists since (and probably before!) the construction of the Great Pyramid. As scholars and artists of eras gone by discovered (such as Leonardo da Vinci, Plato , & Pythagoras), the intentional use of these natural proportions in art of various forms expands our sense of beauty, balance & harmony to optimal effect. Leonardo da Vinci used the Golden Ratio in his painting of The Last Supper in both the overall composition (three vertical Golden Rectangles, and a decagon (which contains the golden ratio) for alignment of the central figure of Jesus. The outline of the Parthenon at the Acropolis near Athens, Greece is enclosed by a Golden Rectangle by design, sacred geometry. The Vesica Piscis is formed by the intersection of two circles or spheres whose centers exactly touch. This symbolic intersection represents the "common ground", "shared vision" or "mutual understanding" between equal individuals. The shape of the human eye itself is a Vesica Piscis. The spiritual significance of "seeing eye to eye" to the "mirror of the soul" was highly regarded by numerous Renaissance artists who used this form extensively in art and architecture. The ratio of the axes of the form is the square root of 3, which alludes to the deepest nature of the triune which cannot be adequately expressed by rational language alone, sacred geometry. This spiral generated by a recursive nest of Golden Triangles (triangles with relative side lengths of 1, phi and phi) is the classic shape of the Chambered Nautilus shell. The creature building this shell uses the same proportions for each expanded chamber that is added; growth follows a law which is everywhere the same. The outer triangle is the same as one of the five "arms" of the pentagonal graphic above. Rotating a circle about a line tangent to it creates a torus, which is similar to a donut shape where the center exactly touches all the "rotated circles." The surface of the torus can be covered with 7 distinct areas, all of which touch each other; an example of the classic "map problem" where one tries to find a map where the least number of unique colors are needed. In this 3-dimensional case, 7 colors are needed, meaning that the torus has a high degree of "communication" across its surface. The image shown is a "birds-eye" view, sacred geometry. The progression from point (0-dimensional) to line (1-dimensional) to plane (2-dimensional) to space (3-dimensional) and beyond leads us to the question - if mapping from higher order dimensions to lower ones loses vital information (as we can readily observe with optical illusions resulting from third to second dimensional mapping), does our "fixation" with a 3-dimensional space introduce crucial distortions in our view of reality that a higher-dimensional perspective would not lead us to? There is a wealth of good literature on this subject; it's always fascinating how nature propagates the same essence regardless of the magnitude of its expression...our spirit is spaceless yet can manifest aspects of its individuality at any scale, sacred geometry. The 3/4/5, 5/12/13 and 7/24/25 triangles are examples of right triangles whose sides are whole numbers. 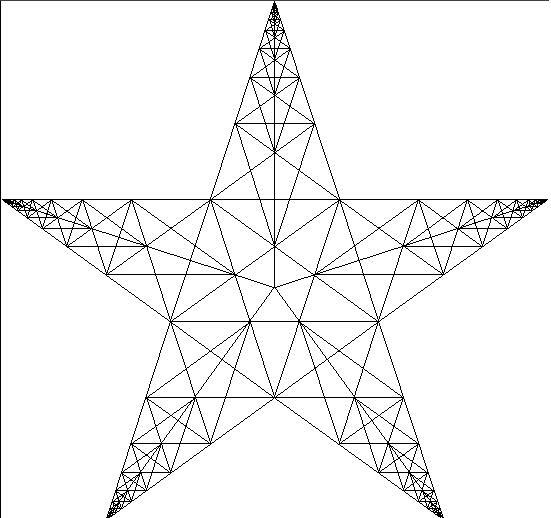 The graphic above contains several of each of these triangles. 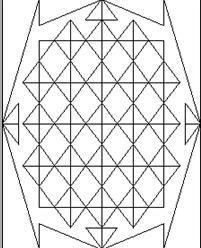 The 3/4/5 triangle is contained within the so-called "King's Chamber" of the Great Pyramid, along with the 2/3/root5 and 5/root5/2root5 triangles, utilizing the various diagonals and sides, sacred geometry. The 5 Platonic solids (Tetrahedron, Cube or (Hexahedron), Octahedron, Dodecahedron & Icosahedron) are ideal, primal models of crystal patterns that occur throughout the world of minerals in countless variations. These are the only five regular polyhedra, that is, the only five solids made from the same equilateral, equiangular polygons. To the Greeks, these solids symbolized fire, earth, air, spirit (or ether) and water respectively. The cube and octahedron are duals, meaning that one can be created by connecting the midpoints of the faces of the other. The icosahedron and dodecahedron are also duals of each other, and three mutually perpendicular, mutually bisecting golden rectangles can be drawn connecting their vertices and midpoints, respectively. The tetrahedron is a dual to itself, sacred geometry. 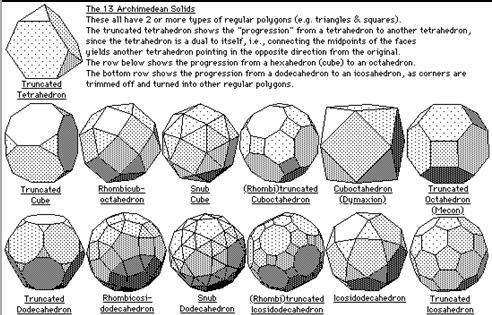 There are 13 Archimedean solids, each of which are composed of two or more different regular polygons. 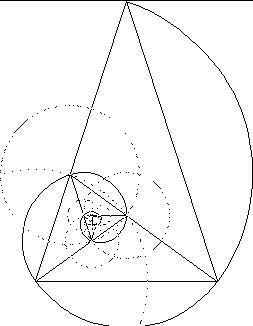 Interestingly, 5 (Platonic) and 13 (Archimedean) are both Fibonacci numbers, and 5, 12 and 13 form a perfect right triangle, sacred geometry. Metatron's Cube contains 2-dimensional images of the Platonic Solids (as shown above) and many other primal forms. Indelibly etched on the walls of temple of the Osirion at Abydos, Egypt, the Flower of Life contains a vast Akashic system of information, including templates for the five Platonic Solids. The background graphic for this page is a repetitive hexagonal grid based on the Flower of Life, sacred geometry. For further information on the Flower of Life, check out the material from Gregg Braden and Drunvalo Melchizedek. Final note: The universe is created by a consciousness which manifests in physical reality through a geometric blueprint that we call Sacred Geometry which repeats over and over giving the illusion of linear time.